First to be reviewed is a book of two plays by Carl Djerassi, Chemistry in Theatre; Insufficiency, Phallacy, or Both. Imperial College Press, London, 2012, 112 pp. ISBN 978-84816-938-8 (paper) $24. Djerassi, in addition to a multitude of scientific articles and five monographs, is also the author of several works of chemistry oriented nonfiction including eight plays. The most notable of the latter includes Oxygen, a play co-authored with Nobelist Roald Hoffmann. In this ninth book of plays, Djerassi makes a strong case in the introduction for writing plays to be read and not necessarily produced on stage. He posits that in general even famous plays are often read by more people, especially by students, than actually see the plays on stage. He describes the stages in play crafting, writing the play as literature aimed at the reader, writing for a reading (on stage or radio), and finally writing for performance. Oxygen was the latter although it appeared in print before it was performed (a video of a performance exists, University of Wisconsin, 2003). Other plays with chemical subjects are also discussed, all too few in the opinion of the author. The two plays in this volume were written to be read. The first, Insufficiency, concerns the battles of an immigrant chemistry professor to obtain tenure at a “second-rate” American university. His research topic is bubbles, specifically in champagne and beer, which is deemed by his department to be trivial which results in the tenure battle. The play is in nine scenes and is cast with eight characters and involves romance, intrigue, academic politics, and a pretty fair portion of authentic physical chemistry. The second (pun intended) play, Phallacy, is in 27 relatively brief scenes and is cast for eight characters. Set in the world of art in Vienna, there’s another battle going on, this one between the director of museum antiquities and a professor of chemistry who’s also head of the art conservation department of a technical institution. The subject is the authenticity of a bronze statue, described in her lifework by the art historian as Roman, but discredited by the chemist, using trace metal analysis, as being a Renaissance “fake.” Both of the protagonists’ assistants are also roped into the battle which, since they are romantically involved with each other, makes for more intrigue and humor. A series of historical flashback intermezzi contributes to the eventual resolution of the dispute. The two plays make enjoyable reading even if the reader is not a chemist nor in academia. I also recommend them to schools for classes in literature and drama as well as in science and chemistry. My family has scientists, actors, and teachers and I intend to bring this book to their attention. 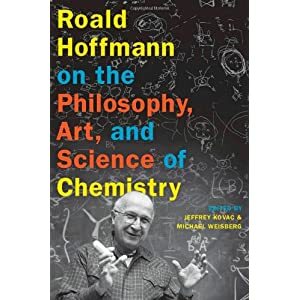 Second to be reviewed is a book, Roald Hoffmann on the Philosophy, Art, and Science of Chemistry, edited by Jeffrey Kovac and Michael Wessberg. Oxford University Press, New York, 2012. 390 pp. ISBN 978-0-19-975590-5 (hardback). £22.50. Hoffmann’s writing style is excellent and versatile, mirroring his writing as a polymath in the sciences, poetry, and drama. Items on the history of chemistry are salted throughout the text. Consistent with the scientific style, the text is heavily footnoted, which can lead to a whole new library for reading. The book is organized into five sections: chemical reasoning and explanation, writing and communicating, art and science, chemical education, and ethics in science. In the first, explanation does not always lead to reasoning. Ockham’s Razor is discussed in detail including strengths and weaknesses and why it is often misused. Communication covers the debate on third person, passive scientific writing. Hoffmann makes the case for a more human approach. He also stresses the need for scientists to communicate with the public in an approachable style. In the section on art and science, Hoffmann confesses that he once considered a career in art history. His track record as a poet and playwright is excellent. The section also covers science and crafts as well as the beauty of molecules. In education, the expectations of the teacher and the students do not necessarily match and a merger of the expectations and results should be the goal. He advocates that students should take lecture notes by hand and then transcribe or rework them after class. (Again, this reviewer agrees since this was method he used more than 50 years ago.) In the section on ethics, Hoffmann posits that science is not ethically neutral. The environment and green chemistry are discussed in detail. Drawings, chemical structures, artwork, cartoons, and reproductions of classic articles are prominent in the text. Overall, an excellent read on a number levels. Highly recommended for students, teachers, and practitioners of chemistry as well as the technically oriented public.